Flowers can be an important part of your church’s look and feel. From the symbolism of lilies at Easter or poinsettias at Christmas to the flowers congregants give to honor special people and occasions to the arrangements given in thanks to the church, flowers, can be very meaningful in the life of the church. Where to put them can be a challenge. If you’re considering purchasing new church furniture for your sanctuary, knowing what other accessories you’ll need to budget for is important to getting the most out of your church furniture company. 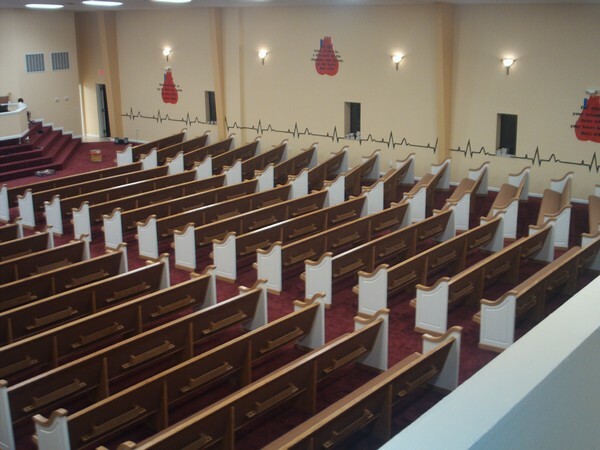 When we work with churches to install new church furniture, most of the time people are focused on church pews. But there are plenty of other things to consider, from pulpits and communion tables to chairs and baptismal fonts. One of the most easily forgotten is floral stands and tables. Flowers can find their place near the altar in different ways. Often churches place them on the floor in front of the pulpit or on the altar itself or even on steps leading up to the altar. The truth is, this doesn’t highlight the time and effort that goes into these decorations and doesn’t show appreciation for the flowers and the time and money spent by volunteers to take care of them. Flowers piled up on the floor also draw the attention downwards, instead of up towards the speaker who is teaching and reading the Word. Flowers serve as a reminder of God’s work in the world around us and remind us to marvel in his work. Having to leave the flowers on a table in the narthex because there is no place for them in the sanctuary limits our ability to use them meaningfully in worship. On top of regular services, holiday services and weddings can use special accessories like flower stands to give your church something special. If you rely on weddings to pay the bills, it’s important to provide everything a bride might want in a location, which might mean flower stands for a beautiful arrangement. We can build matching flower stands for your church when you purchase new church furniture or even just build them on their own to match your existing furniture. Contact us and we can help make your flowers even more special.